I think the title of the article is obvious and isn’t new. But what interested me was the UHI effect and causes and the admission it it huge. “Deniliquin’s maximum and minimum temperatures were recorded at the Post Office from 1873 to 1971, before the station was relocated to the airport in 1984. The records from the Post Office indicate that in Deniliquin the annual average minimum temperature increased by 2.1 deg C until 1971. However when the monitoring station was moved out of the urban area, the last 20 years of record shows that the nighttime temperature is 0.6 deg C lower than the previous 98 year average. This indicates that the urban area of Deniliquin may be warmer than its surrounding rural regions. Wind Map – Do Cities change the wind patterns? The live version of this wind map is pretty cool. 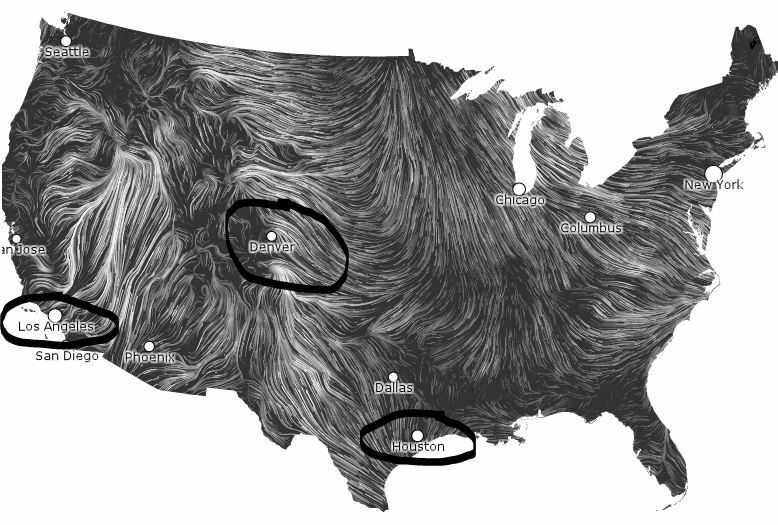 But notice the wind patterns going around cities. How much does the giant UHI bubble around cities alter wind patterns for miles and miles?